Toyota Motor Corp. reportedly will introduce their new product variants. Later, the new car is predicted to be adopting the old cars design. As quoted from the Motoring, the world's largest auto manufacturer will introduce a sports car named the 'Midget'. 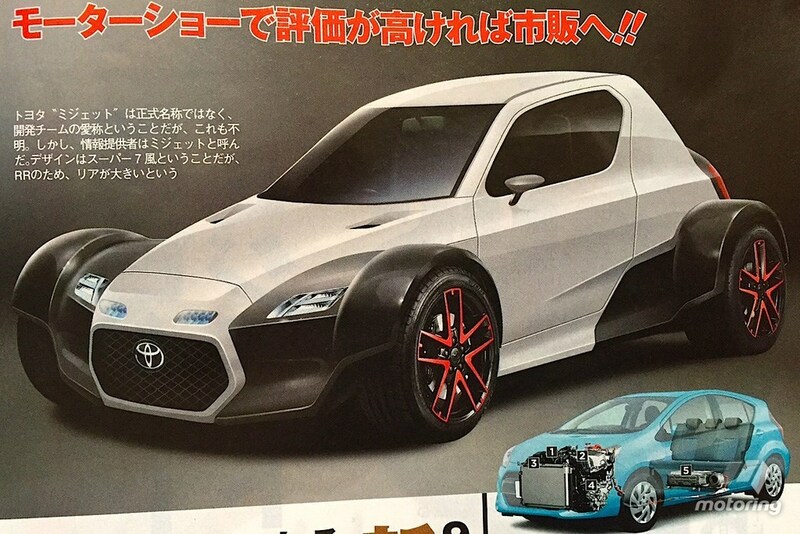 This car will be positioned as the sister of the Toyota 86. Such a design is on display in Best Car, one of the Japs automotive magazines, the model will look like the MG TC that had been introduced in 1945 or Lotus Seven produced in 1957-1972. Midget name itself was chosen to describe a lightweight three-seater four-wheeled vehicle. As shown in the photo above, the whole car tire is very unique because it is outside the body with large fender that envelops the tire. With the wheels cross a red color, is indeed impressed sporty car. With the design, Toyota hopes to tempt young people in Japan to have a car with a unique shape but with a large force typical of a sports car. Although the classic style, this car is expected to carry the environmentally friendly engine, or in other words, the Japanese auto manufacturer is expected to install the fuel cell technology mechanical drive in the car. Moreover, according to their internal, the introduction of this concept car is also a long-term project to create a Japanese version of Midget speedway racing series that famous in Australia and the United States (US).